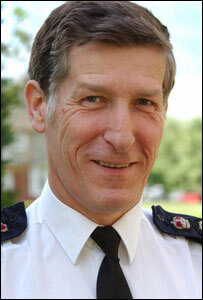 The chief constable of Northumbria Police has announced that he is to leave his job early next year. Crispian Strachan, 55, took up his post in April 1998, joining the force from Strathclyde where he had been assistant chief constable. In a statement on Thursday, Mr Strachan said he was looking forward to new challenges. He said he has been proud to head one of the UK's best performing police forces for seven years. Mr Strachan joined the Metropolitan Police as a graduate entrant in 1972. Between 1985-8 he was posted to the Royal and Diplomatic Protection service and was a trained hostage negotiator and security co-ordinator. He was awarded the Queen's Police Medal in 1996 and the CBE in 2003. He said of his time with Northumbria: "It has been an immensely rewarding experience and I'm now looking forward to the new challenges which lie ahead." Last year, he changed the Northumbria force's structure with the aim of making the police more closely aligned to the communities they serve. A report from the Home Office Police Standards Unit this week showed that Northumbria either improved on or matched last year's performance - scoring the best results in its group for reducing and investigating crime. Northumbria Police Authority chairman Mick Henry said: "Crispian Strachan is held in high regard by all of us. He has proven himself an extremely able chief constable and he has been a genuine pleasure to work with. "We wish him continued success in the future."